The wedding day is, to many, one of the most exciting and most anticipated days of a person’s entire life! So much preparation is put in place leading up to the big day, and both the bride and the groom work so hard to make sure everything is absolutely perfect for their special day. With your wedding day will come certain traditions. 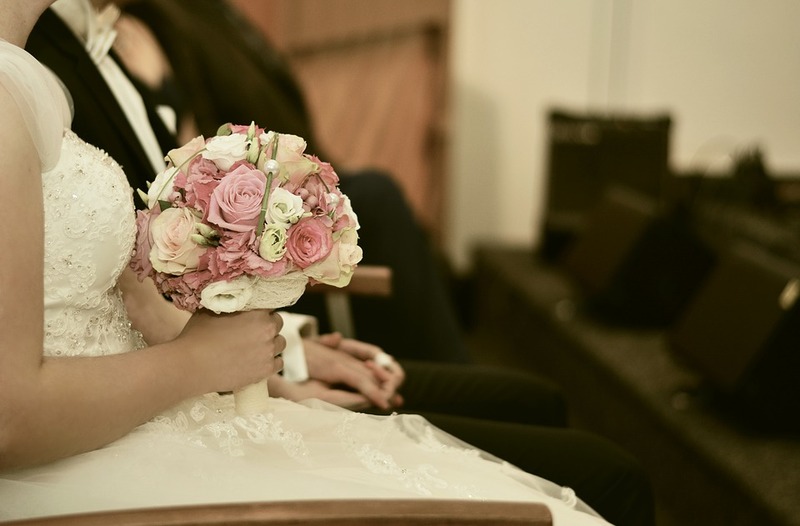 There are some traditions you can definitely ignore, but others you might want to consider in order to keep the pre-wedding jitters at bay, to increase the romantic suspense, and to ensure the day goes off without a hitch. Here are the top seven pre-wedding traditions you don’t want to skip out on. While it might be tempting to spend the night before your wedding with your sweetie, this is one tradition that you definitely want to follow before your wedding day. The night before your wedding should be spent with your family and friends. Spend the night watching wedding movies, reminiscing with your parents and siblings, or having one final family meal with your original last name intact. The wait and separation will make your wedding night that much sweeter and more special. This tradition might seem a little ridiculous at first, but the peace of mind it is said to instill is worth a little bit of silliness in the meantime. According to this tradition, if you collect a coin from each of your parents or guardians (or another trusted individual in your life) and put one in each of your wedding shoes, you will never want, financially, later in life. Sure, it sounds a little silly, now, but if it works, it’ll be worth asking for a penny or two. This tradition is a good one for the superstitious ladies out there. It is said that using your married name before you actually take your partner’s name can be bad luck and jinx your happily ever after. If nothing else, waiting until your wedding day to try out your new Mrs. _____ will create a sense of happy suspense that results in intense joy on your “I do” day! Enjoy your last days with your original name before you upgrade! This Southern tradition is a cute one that you can involve your significant other in, as well! Burying the bourbon isn’t a euphemism – it’s literally burying a bottle of bourbon outside. Typically, you’ll want to bury a bottle of your favorite bourbon near your wedding venue exactly a month before you exchange vows. According to Southern legend, doing so will ensure perfect weather is the backdrop of your perfect day. And guess what! That bourbon doesn’t go to waste! You and your spouse (!!!) are supposed to dig it up together after the ceremony to share together in celebration of your matrimony! The bachelorette party is known as the last fling before the ring! Get together your best group of gal pals and take to the town! This particular tradition is a newer one that celebrates a woman’s independence, which is, of course, not forfeited when you take your partner’s name – but that doesn’t mean you don’t want to go out before your wedding night and live it up! The traditional bachelorette party is a fun way for Luv Bridal brides-to-be to have fun with your best friends and enjoy the few final hours you’ll be a single lady. If you’re wondering what are some fun ways to enjoy your bachelorette party, take a look here! Whether you decide to dance, drink, sing, stay in, or go out, just make sure you revel in your first true loves: your besties! This final tradition is nothing but sweet and is meant to be enjoyed together. Along with your soon to be spouse, spend some time registering at your favorite stores for the things that will make your new wedded bliss the absolute best! Why not make a whole day of it? This fun tradition can be completed online, but it’s so much better to turn registering for your favorite must-haves into one of the last date’s you two will go on with different last names. Plus, presents! Pre-wedding traditions are meant to serve as exciting ways to prepare for your happily ever after. They are rituals rooted in the deep belief in marriage, love, and happiness. Whether you decide to try all seven or mix and match the ones that suit you and your relationship, you can rest assured that all of your plans will come together to form your perfect, much awaited day. In the meantime, enjoy the days leading up to your wedding and know that it will be one of the greatest days of your entire life – traditions or not!